This is a question that our customers will frequently have – we get pruning requests year-round, but not all seasons are equally as good of a time to prune a tree. Generally speaking, you'll want to trim your trees when they're dormant – preferably late autumn and winter. 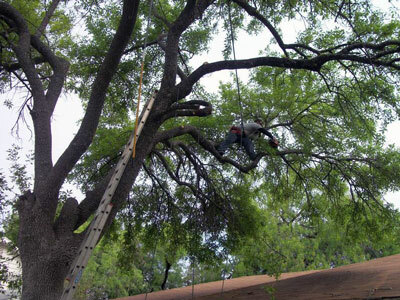 Pruning will always cause unnatural stress for the tree, even when it's done by certified professionals like us. Therefore, every tree trimming job should be done while keeping the time of year in mind in order to avoid causing additional issues. There's an added benefit of trimming during a tree's dormancy: during this time, the bacteria, fungi and insects nesting in the tree will also be dormant and are far less likely to migrate to other parts of the tree as we remove the branches they're inhabiting. Hence, pruning during the autumn (especially late autumn) and winter is the most effective way of dealing with infestation on a tree and is always the preferable choice. Unfortunately, pruning during the colder seasons isn't always possible. Sometimes, the property owner is working under time constraints – for example, they might only be present in the area during the spring and summer. Another scenario where a tree might need to be trimmed 'off-season' is in the case of a particularly severe infestation, be it by insects or bacteria. Here, the tree owner can't afford to wait a second longer than is necessary and should call upon us at his or her earliest convenience. While it's true that removing infested branches is far more effective in the fall and winter seasons, the option to wait isn't there when an infestation has spread too far. Moreover, removing severely-infested branches in the spring and summer will still yield good results due to the sheer number of unwanted inhabitants. ​Because trimming when the tree is 'awake' causes additional stress to the tree, trimming off-season to deal with an infestation can actually make way for a new infestation later on. This is why we highlight the importance of regular tree maintenance regardless of where you live and the amount of trees you're working with – a well-maintained tree inspected by our certified arborist in the off season isn't likely to come under serious disease. To add yet another benefit to trimming trees during their dormant season, the lack of leaves will give you a much better idea of where the branches are growing as well as their true volume. Tree owners can sometimes panic during the spring and summer as their tree blooms and will hop to trimming thinking that the tree has simply grown too large when it's mostly a case of abundant leafy growth. This is why, in the absence of an infection or infestation, we always advise our clients to wait with any serious trimming job until all the leaves have fallen so that they can get a better look into what the tree's branches look like.